There’s always a few hidden gems that turn up at CES. And 2017 is no exception, with HD Guru uncovering an unannounced TiVo Philips partnership. The initiative seemingly confirms TiVo’s intent to diversify their retail hardware business, with Philips preparing a line of over-the-air TiVo-powered personal video recorders (PVR). The mash-up is also notable given the companies* history, having launched the very first TiVo together way back in 1999. The two-tuner prototype on display was a pretty nondescript black set-top, appearing to reuse an existing enclosure at this phase of development. Marketing imagery at the show indicates the DVRs will feature a “built-in EPG powered by TiVo for an intuitive program navigation, selection, and recording experience.” Further, the integrated wireless networking of at least one model will provide “smooth streaming of live or recorded video on your home network” — unlike most existing, native TiVo experiences, which also facilitate out-of-home streaming to iPads and the like. The interface, as pictured in the booth, looks nothing like the current or upcoming TiVo UI. It’s not clear to me if the Roku-esque presentation is merely a placeholder, if TiVo is creating something new for partners, or if Philips is merely relying on TiVo-tech underpinnings and the Rovi guide. In any event, the cord cutting market could certainly benefit from additional players in this space and Philips appears to have been seeking retailer feedback at the show as they march towards a September release. On the other end of the spectrum, TiVo is also forging ahead with relatively new partner Arris on a pair of 4K UHD DVRs they intend to make available to cable partners. It is capable of presenting encrypted SD and HD video content through HDMI™ 2.0 and Analog Composite (SD content only), digital audio is presented through HDMI™ and Optical SPDIF, and analog audio is presented through baseband 3.5mm connector. It has a removable hard-drive for DVR capability, SD card slot, and single USB2.0 port for external peripherals. Wireless interface includes RF4CE with embedded antennas. P&F USA, Inc. located at Alpharetta, GA is a subsidiary of Funai Electric Co., LTD and is the exclusive licensee for Philips consumer televisions and home video products in North America. Philips partial intent at the show seemed to be gauging retailer interest – that would probably drive how many models and what many features make the cut. And they really need those retail partnerships to drive awareness and sales. 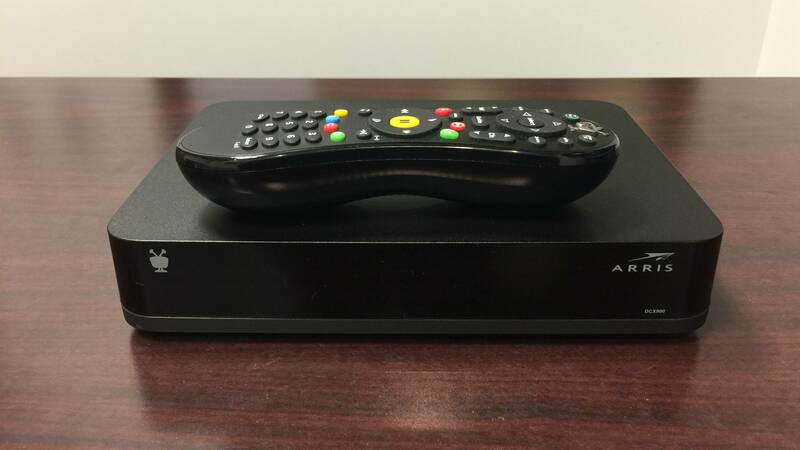 The pictured Arris box is the DCX900, from a friend below, while the latest FCC filing is the DCX905. Primary difference appears to be the integrated DOCSIS modem in the newer model. This would be more compelling if they hadn’t totally destroyed the reliability of the guide data with the switch. After all these months I still have a handful of channels that only show “To Be Announced” 24/7. New episodes of shows don’t record sometimes because the TiVo think it’s an old episode, and old episodes record thinking it’s new. For the first time in the 16~ years I had had a TiVo I am doing more than just casually looking to switch to something else. I had a couple of station listing problems like that. If you haven’t tried calling support I would do so. They had me go through some sort of reset procedure that I didn’t think would do anything but it actually worked. I wouldn’t think TiVo would partner with a company to put out a retail DVR featuring TiVo branding but which didn’t use the TiVo UI. When you get down to it, the UI is pretty much all TiVo is, from a consumer perspective. That’s what differentiates it from any other DVR, not the basic functionality or guide data. Maybe the only basis for Philips using the TiVo name at CES was because the box will use TiVo (formerly Rovi) guide data. But if that were the case, I doubt TiVo would allow their branding/logo to appear on the box. Unless this Philips DVR is priced pretty low, I don’t really see how it succeeds given the existence of other OTA DVRs already on the market from TiVo, Tablo, ChannelMaster and Magnavox. Unless you can bring a two-tuner ota dvr to market for around 150 dollars don’t bother. It’s not a big market for these devices. If the Philips comes to market that would make three brands actually by built by Funai, Funail actually builds the Maganox and the Channel Master also. Of course Funai used to make a lot of OEM vcr’s in the past. Will they continue Tivo’s practice of charging a monthly fee? Some day, viewers will be able to watch any show they want, when they want, and pay only for what they watch. In the meantime, we’ll continue this silly game…. Some day people will pay for only what they watch, and wonder how the price crept up so much. Things can only go up. Things can’t much cheaper going ala carte then they are now. Sadly I’m in agreement with MJR, Bud. Be careful what we wish for. A la carte was a fantasy. Tim, you’d think so. But there was that Best Buy TiVo television… which only partially looked like a TiVo. “Things can only go up.” – Wrong! I pay less than half for TV than I did 5 years ago and watch more. There is still a lot of improvements needed. Viewing will only get easier as the market eliminates the old TV and cable model. I have always hoped that Tivo would become the clearing house for all sources of content, including OTA and Internet-based, providing a seamless interface at a low cost, but their progress and direction has been disappointing. OTA is taxpayer subsidized and ads take care of the rest. That model will eventually fail and your government will be putting money elsewhere. Dave, the Insignia TiVo TV at BestBuy pretty much had a TiVo UI, just without the DVR controls/features (which, admittedly is the centerpiece of the TiVo UI). I guess it was TiVo’s toe-in-the-water experiment of branching out beyond DVRs into also becoming a smart TV OS. (Must’ve been before it become very clear that TiVo wasn’t attracting sufficient app developers.) But all that said, the TV’s menus (and remote?) are still easily identifiable as TiVo, which wasn’t the case with the Philips DVR shown at CES. Nice, thanks for sharing the imagery! Looks like you’ve got the DCX900 and the recent FCC filing with DOCSIS modem is for the DCX905. I worked in TV for 20 years and we never got government funding, despite being forced to run PSAs and “community oriented” programming to keep our FCC license. The *only* help we ever got was OTA channels being labelled “must carry” for cable systems. The broadcast spectrum being publicly owned is a key part of why I thought Aereo should’ve won their court case. So, when does the Sony version come out if we’re going back in time ;) My Sony SAT-T60 was, at the time, one of the best AV components I ever purchased and it may have been the only time a manufacturer didn’t disappoint me when they finally activated that 2nd tuner after initial release. These products represent the end of the TiVo DVR as we know it. Please, the Phillips a mere TWO tuner DVR? That is a pure Phillips product with the TiVo logo and “Powered by TiVo” lipstick on a pig. The Bolt currently the latest Series and still for sale will be the last true, sophisticated retail TiVo to ever exist. It is clear that Rovi’s business model is to get out of the traditional DVR business and just license its patents and, perhaps most valuable, license the TiVo logo and name giving junk DVR’s the patina of what WAS the well-regarded TiVo brand that existed before Rovi buyout. Rovi has a reputation of not really having designed and made a thing in its existence and has left those and products dependent on its guide data in the lurch resulting in bricking hardware/DVR’s as a result. And the MSO “co-branded” box is another example of lipstick on a pig: the real brand of the inferior DVR and the logo/brand of TiVo for any who want to pay for the privilege. And while the old TiVo management might have had standards before allowing their brand on any other product, Rovi just doesn’t care, so don’t expect any standards for any product willing to pay Rovi to imbue its lousy DVR with the TiVo aura. The Mantis, since renamed to–whatever–is a fine example of a product that just does not measure up to current and past TiVo DVR’s, and with well rumored Cloud DVR and, if I remember correctly, for OTA operation only. I would not expect any future TiVo’s for MSO’s to be anything like they are today: a real TiVo DVR at hear designed to function with a particular cable co. Instead it will be a lousy cable DVR in almost every way except for a license for one patent here or there and, the big prize, the TiVo logo. All that my IMHO, but I think we all know that it is not too far from the truth we know will soon be upon us. TiVo, you were great DVR, but your future is more dim than the axed TiVo videos that use to play upon boot-up. I miss those boot-up videos :). Two tuners? What is this 2001? I had two tuner DVRs back then. I like my current four and six tuner DVRs I’m using now. No way could I ever go back to a two tuner DVR. Even when I used VCRs I had six tuners for recording with six VCRs in use.